Proprietary Name: Trader Joes Zinc Oxide Sunscreen Spf 40 What is the Proprietary Name? 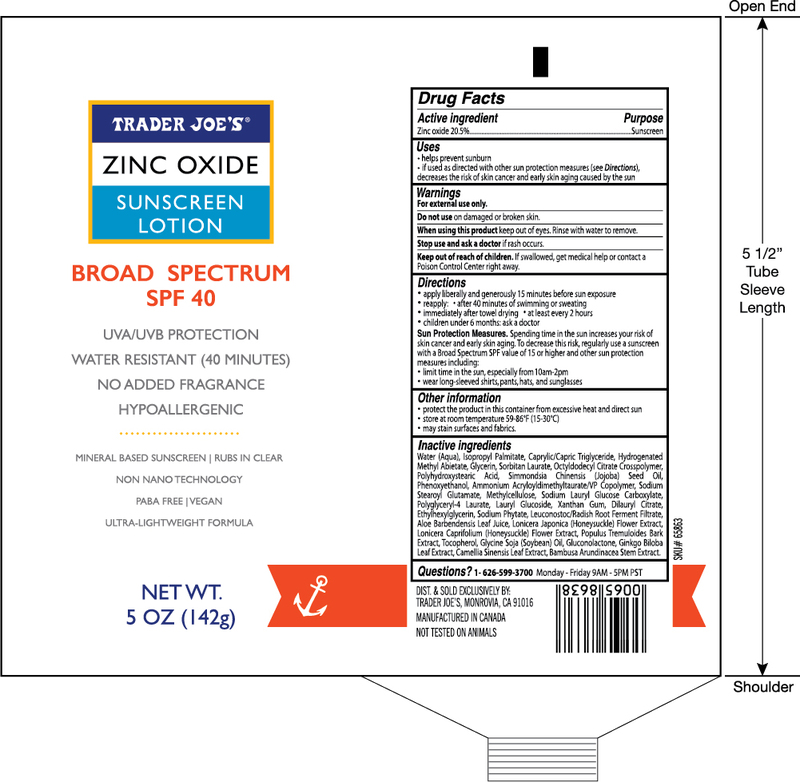 Trader Joes Zinc Oxide Sunscreen Spf 40 with NDC 71270-151 is a a human over the counter drug product labeled by Trader Joe's Company. The generic name of Trader Joes Zinc Oxide Sunscreen Spf 40 is zinc oxide. The product's dosage form is lotion and is administered via topical form. Helps prevent sunburn.If used as directed with other sun protection measures (See Directions), decreases the risk of skin cancer and early skin aging caused by the sun. For external use only.Do not use on damaged or broken skin.When using this product, keep out of eyes. Rinse with water to remove.Stop use and ask a doctor if rash occurs. Apply liberally to face and body 15 minutes before sun exposure.Reapply after 40 minutes of swimming or sweatingimmediately after towel dryingat least every 2 hours.Children under 6 months: ask a doctor.Sun Protection Measures. Spending time in the sun increases your risk of skin cancer and early skin aging. To decrease this risk, regularly use a sunscreen with a Broad Spectrum SPF 15 value or higher along with other sun protection measures including: limit time in the sun, especially from 10 a.m. – 2 p.m.wear long sleeved shirts, pants, hats and sunglasses. Protect the product in this container from excessive heat and direct sunstore at room temperature 59-86°F (15-30°C)May stain some fabrics. WATER (AQUA), ISOPROPYL PALMITATE, CAPRYLIC/CAPRIC TRIGLYCERIDE, HYDROGENATED METHYL ABIETATE, GLYCERIN, SORBITAN LAURATE, OCTYLDODECYL CITRATE CROSSPOLYMER, POLYHYDROXYSTEARIC ACID, SIMMONDSIA CHINENSIS (JOJOBA) SEED OIL, PHENOXYETHANOL, AMMONIUM ACRYLOYLDIMETHYLTAURATE/VP COPOLYMER, SODIUM STEAROYL GLUTAMATE, METHYLCELLULOSE, SODIUM LAURYL GLUCOSE, CARBOXYLATE, POLYGLYCERYL-4 LAURATE, LAURYL GLUCOSIDE, XANTHAN GUM, DILAURYL CITRATE, ETHYLHEXYLGLYCERIN, SODIUM PHYTATE, LEUCONOSTOC/RADISH ROOT FERMENT FILTRATE, ALOE BARBADENSIS LEAF JUICE, LONICERA JAPONICA (HONEYSUCKLE) FLOWER EXTRACT, LONICERA CAPRIFOLIUM (HONEYSUCKLE) FLOWER EXTRACT, POPULUS TREMULOIDES BARK EXTRACT, TOCOPHEROL, GLYCINE SOJA (SOYBEAN) OIL, GLUCONOLACTONE, GINKGO BILOBA LEAF EXTRACT, CAMELLIA SINENSIS LEAF EXTRACT, BAMBUSA ARUNDINACEA STEM EXTRACT.